Much is often made of California's urban-rural divide but there are often good reasons why things are done differently in different regions. An example can be found in a growing effort to view smart growth and sustainability goals from a rural perspective, and one innovative water and land-use planning tool created to do that in California just earned some national recognition recently. The ambitious planning model called the Rural-Urban Connections Strategy (RUCS) landed in the top 25 programs in this year’s Innovations in American Government Awards competition held by the Ash Center for Democratic Governance and Innovation at Harvard's School of Government. 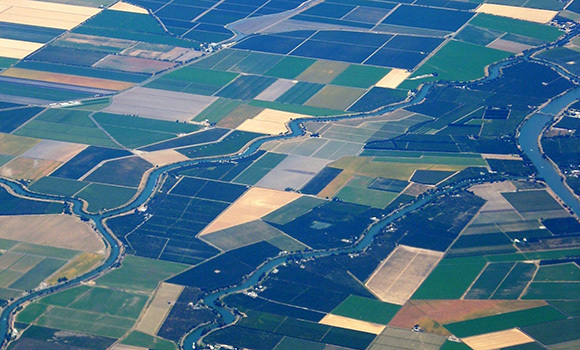 The Sacramento Area Council of Governments (SACOG) launched the RUCS model in 2008 to increase the amount attention being paid to rural areas of the region and the amount of landscape information available when it came to land use and transportation planning. The Innovations in American Government Awards have been given out nationally since 1985 to highlight models of innovation at all levels of government. “Each Top 25 program can become a blueprint for similar enterprises at all levels of government, inspiring leaders around the country to help improve their communities with opportunities for dialogue and replication,” said Tony Saich, director of the Ash Center, in the announcement release. RUCS uses data and computer modeling to map a region's natural assets and inform how to preserve and manage those lands accordingly. An example of the tools used in the strategy is compiling crop reports data to dive into the value and production levels of specific crops. In addition, proponents of this kind of modeling say conservation is actually given a boost by strategies that more accurately measure the value of rural lands. One of the key goals of the California Economic Summit's Working Landscapes Action Team is to help promote the RUCS model to statewide level. The objective is to expand use of data-driven approaches like RUCS to show how managing lands holistically can improve the economy and be sustainable in the long term. Working lands, in case you're wondering, include farmland, ranches, forests, wetlands, mines, water bodies and other natural resources. As the state's population shoots upward, it will be increasingly important to understand the links between rural regions with the urban parts of the state and provide a steady source of diverse jobs (from agriculture to energy production), while also protecting vital natural resources (including clear air and wildlife habitat). That's why RUCS has been held up as an important tool by the Summit, especially with its focus on giving proper attention to regional strengths and vital sectors, for example, Sacramento's agriculture and food industries. At the same time, the model's broad scope is designed to give weight to conserving open lands and the ecosystem benefits they provide, like wetlands that can filter pollutants or a wilderness area that provides recreation and jobs. One RUCS case study involved studying Yuba County's working lands to allow officials and farmers to better understand the assets of the region and respond to trends, like demand for locally grown food. The study also examined urbanization of the region and the value of a loss of farmlands to development. It's another example of the Workforce Action Team's goal of providing state and regional governments a better range of economic and environmental indicators and metrics to assess strategies that protect and enhance working landscapes. At the same time, the Team is collaborating with other Action Teams on the Summit's Roadmap to Shared Prosperity.